At Microsoft Ignite 2017, we announced Azure Migrate – a new service that provides guidance, insights, and mechanisms to assist you in migrating to Azure. We made the service available in limited preview, so you could request access, try out, and provide feedback. We are humbled by the response received and thankful for the time you took to provide feedback. Today, we are excited to launch the preview of Azure Migrate. The service is now broadly available and there is no need to request access. Azure Migrate enables agentless discovery of VMware-virtualized Windows and Linux virtual machines (VMs). It also supports agent-based discovery. This enables dependency visualization, for a single VM or a group of VMs, to easily identify multi-tier applications. Readiness: Is a VM suitable for running in Azure? Rightsizing: What is the right Azure VM size based on utilization history of CPU, memory, disk (throughput and IOPS), and network? Cost: How much is the recurring Azure cost considering discounts like Azure Hybrid Benefit? The assessment doesn’t stop there. It also suggests workload-specific migration services. For example, Azure Site Recovery (ASR) for servers and Azure Database Migration Service (DMS) for databases. ASR enables application-aware server migration with minimal-downtime and no-impact migration testing. DMS provides a simple, self-guided solution for moving on-premises SQL databases to Azure. Once migrated, you want to ensure that your VMs stay secure and well-managed. For this, you can use various other Azure offerings like Azure Security Center, Azure Cost Management, Azure Backup, etc. Azure Migrate is offered at no additional charge, supported for production deployments, and available in West Central US region. It is worthwhile to note that availability of Azure Migrate in a particular region does not affect your ability to plan migrations for other target regions. For example, even if a migration project is created in West Central US, the discovered VMs can be assessed for West US 2 or UK West or Japan East. Get and stay informed by referring documentation. Seek help by posting a question on forum or contacting Microsoft Support. Provide feedback by posting (or voting for) an idea on user voice. 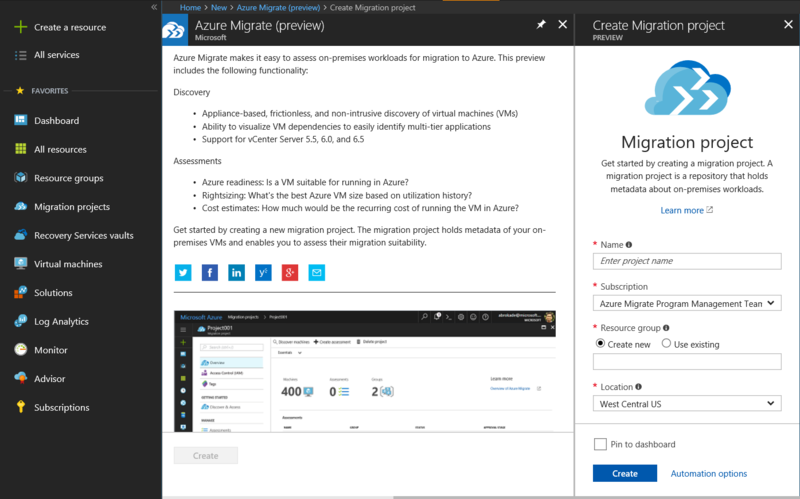 Hope you will find Azure Migrate useful in your journey to Azure!